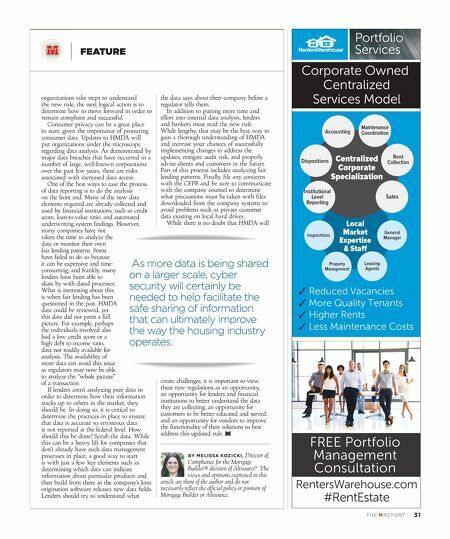 TH E M R EP O RT | 31 FEATURE As more data is being shared on a larger scale, cyber security will certainly be needed to help facilitate the safe sharing of information that can ultimately improve the way the housing industry operates. Portfolio Services RentersWarehouse.com #RentEstate FREE Portfolio Management Consultation Corporate Owned Centralized Services Model ✓ Reduced Vacancies ✓ More Quality Tenants ✓ Higher Rents ✓ Less Maintenance Costs Centralized Corporate Specialization Dispositions Institutional Level Reporting Sales Rent Collection Local Market Expertise & Sta General Manager Leasing Agents Inspections Property Management Accounting Maintenance Coordination organizations take steps to understand the new rule, the next logical action is to determine how to move forward in order to remain compliant and successful. Consumer privacy can be a great place to start, given the importance of protecting consumer data. Updates to HMDA will put organizations under the microscope regarding data analysis. As demonstrated by major data breaches that have occurred in a number of large, well-known corporations over the past few years, there are risks associated with increased data access. One of the best ways to ease the process of data reporting is to do the analysis on the front end. Many of the new data elements required are already collected and used by financial institutions, such as credit score, loan-to-value ratio, and automated underwriting system findings. However, many companies have not taken the time to analyze the data or monitor their own fair lending patterns. Some have failed to do so because it can be expensive and time- consuming; and frankly, many lenders have been able to skate by with dated processes. What is interesting about this is when fair lending has been questioned in the past, HMDA data could be reviewed, yet this data did not paint a full picture. For example, perhaps the individuals involved also had a low credit score or a high debt to income ratio, data not readily available for analysis. The availability of more data can avoid this issue as regulators may now be able to analyze the "whole picture" of a transaction. If lenders aren't analyzing peer data in order to determine how their information stacks up to others in the market, they should be. In doing so, it is critical to determine the practices in place to ensure that data is accurate so erroneous data is not reported at the federal level. How should this be done? Scrub the data. While this can be a heavy lift for companies that don't already have such data management processes in place, a good way to start is with just a few key elements such as determining which data can indicate information about particular products and then build from there as the company's loan origination software releases new data fields. Lenders should try to understand what the data says about their company before a regulator tells them. In addition to putting more time and effort into internal data analysis, lenders and bankers must read the new rule. While lengthy, that may be the best way to gain a thorough understanding of HMDA and increase your chances of successfully implementing changes to address the updates, mitigate audit risk, and properly advise clients and customers in the future. Part of this process includes analyzing fair lending patterns. Finally, file any concerns with the CFPB and be sure to communicate with the company counsel to determine what precautions must be taken with files downloaded from the company systems to avoid problems such as private customer data existing on local hard drives. 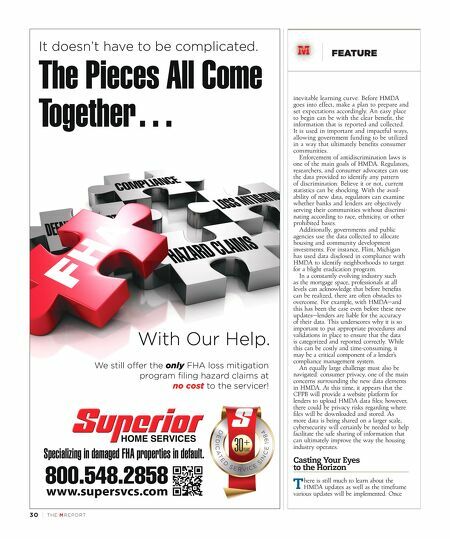 While there is no doubt that HMDA will create challenges, it is important to view these new regulations as an opportunity, an opportunity for lenders and financial institutions to better understand the data they are collecting, an opportunity for customers to be better educated and served, and an opportunity for vendors to improve the functionality of their solutions to best address this updated rule. BY MELISSA KOZICKI, Director of Compliance for the Mortgage Builder® division of Altisource ® . The views and opinions expressed in this article are those of the author and do not necessarily reflect the official policy or position of Mortgage Builder or Altisource.